Konica Minolta announced that the OLED-010K OLED sample kits they have been offering since October 2011 are now discontinued, and they are offering OLED sample panel sets instead. The new sample panel set includes 5 OLED panels (and does not include a driver box and an AC adapter like the sample kits). The new sample panel set costs ¥100,000 (about $1,250), and is now shipping. You can order it here. Size: 74x74x2.8 mm (excluding socket, cord and protruding parts). 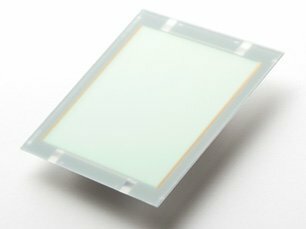 KM's OLED panels use all phosphorescent emitters (KM is using Universal Display's PHOLED technology), it's the same panel that Philips is offering (as the Lumiblade Plus). In fact Philips is producing this panel for Konica Minolta, as was announced in July 2011.